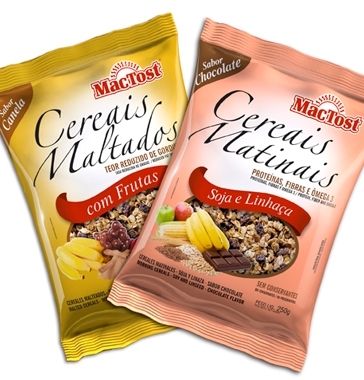 Mac Tost was created in 1977, in Florianópolis. At the beginning the company produced only one brand of potato straws, cereal flakes and some seasonings. Over time and with business expansion new products were added. In 2006, Mac Tost launched their flavoured breakfast cereals. We were requested to develop packaging design for two products: “chocolate flavoured soy and linseed” and “cinammon flavoured fruits”. The cereal flakes package design enhanced artisan and healthy points of the product, highlighting advantages and new flavours. Thus we created a “gourmet”style for this line of products. Apart from graphic design we carefully studied the package structure. We used BOPP packages with PET lamination, an excellent protection barrier for the product. To protect, preserve, transport, store, display and attract consumers are essential properties of packages. Sometimes a creative idea does not fulfill some of these roles or is not viable. That´s why we examined all the details before creating breakfast cereal flakes design for Mac Tost. The result was really appetizing!